Sharon Keller, presiding judge of the Texas Court of Criminal Appeals, could be suspended from office according to the Procedural Rules for Removal or Retirement of Judges if Travis County Attorney David Escamilla files misdemeanor charges in connection with Keller&apos;s failure to report millions of dollars in income and property to the Texas Ethics Commission. For 2006, Keller left off assets that included stock, certificates of deposit, eight sources of income totaling at least $61,500, honoraria of $3,760 and eight real estate interests worth more than $2.4 million. Omissions for 2007 included stock, certificates of deposit, income of $121,500, honoraria of $6,010 and property interests worth almost $2.9 million. Keller may have committed more violations than the 13 she was fined for by the Texas Ethics Commission but the 2-year statute of limitations has run on some of her past filings. Texans need to know that when a high-ranking judge like Sharon Keller breaks the law, she will be charged with a crime just like everyone else. The integrity of our judicial system is at stake in the matter of Sharon Keller. How can people convicted of crimes stand before Judge Keller at the Texas Court of Criminal Appeals and expect to receive justice fairly administered, if they know that she was allowed to break the law without even being charged with a crime? The TEC found that there is “credible evidence of violations of section 572.023 of the Government Code”, so she has broken the law and it is appropriate that criminal charges are filed in addition to the civil penalty assessed by the TEC. The criminal offense for a violation of section 572.023 of the Government Code is a Class B misdemeanor. Read the order from the Texas Ethics Commission announcing her $100,000 fine. Keller could be suspended by the State Commission on Judicial Conduct upon the filing of misdemeanor charges. Rule 15(a) of the Procedural Rules for Removal or Retirement of Judges on the website of the SCJC allows the Commission to suspend a judge “charged with a misdemeanor involving official misconduct”. The annual personal financial disclosure and reporting requirements are part of most elected officials&apos; duties. If she is suspended, the hearing and formal proceedings against Keller by the State Commission on Judicial Conduct in the separate matter of her actions on the day of the execution of Michael Richard would continue on schedule but she would be suspended from performing her duties as a judge. There is a hearing scheduled in Austin on the SCJC proceedings on June 18. 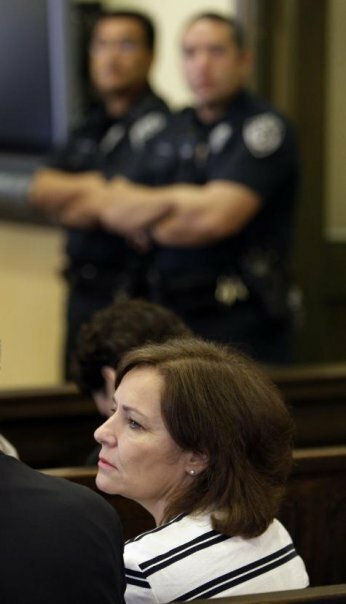 After being charged by the SCJC in the “we close at 5” incident, Keller claimed that she lacked assets to pay private counsel to fight the allegations that she improperly closed the court to a last-minute death-penalty appeal. She suggested that defending herself would be “financially ruinous” – an argument that sounded less than credible at the time given her $152,500 salary and expensive home in West Austin, but now appears to have been completely dishonest, given the amount of income and property she was not disclosing. I called Escamilla to ask about the status of the criminal complaint, which has now been sitting at his office for more than a year. Escamilla had not yet read the TEC opinion himself, declaring that he&apos;d asked two of his prosecutors to review it and report back to him tomorrow with a recommendation how to proceed. Escamilla and I spoke both on and off the record. On the record, he said he hadn&apos;t moved forward before now because he&apos;d been been waiting for the Ethics Commission to complete its investigation. He said he would give “great weight” to the Ethics Commissions findings of fact and conclusions of law, which would have a “great influence” on whether his office elected to proceed with prosecution. Escamilla was particularly impressed that the TEC identified 13 different alleged Class B misdemeanor violations and said the remarkable volume of violations might also be a factor in whether to go forward. The Houston Chronicle editorial board has written that “it is too late for rule of law to apply to Michael Wayne Richard. But it must be applied to Keller, whose deformed ethical compass makes her unfit to judge”. If David Escamilla follows the example set by Ronnie Earle, charges will be filed. And she will be prosecuted. And hopefully removed long before a jury decides. Republicans do not respect the rule of law. But, some Democrats don&apos;t either. Ronnie Earle indicted more Democrats than Republicans. Which no doubt explains why he is not the candidate for lieutenant governor. As for Sharon Keller, if she had a conscience, she would have resigned a long time ago. The Supreme Court might have ruled differently. And the defendant might have been subsequently proven innocent. And would she have cared that unfortunately the defendant had already been executed? We know Sharon Keller did not disclose almost a couple hundred thousand dollars in income to the Texas Ethics Commission for the years 2006 and 2007. I wonder if she also failed to report it to the IRS. Only the IRS can investigate that, not the Travis County Attorney, who can only charge her with a violation of Texas law. She could, though, voluntarily release her income tax returns to show that she is in compliance with federal tax laws. To the TEC, for 2006, Keller left off assets that included stock, certificates of deposit, eight sources of income totaling at least $61,500, honoraria of $3,760 and eight real estate interests worth more than $2.4 million. Omissions for 2007 included stock, certificates of deposit, income of $121,500, honoraria of $6,010 and property interests worth almost $2.9 million.